[dropcap]I[/dropcap]t’s 77 days since José Mourinho’s Manchester United side lifted the Europa League in Stockholm. Thousands of Reds were suitably inebriated as goals from Paul Pogba and Henrikh Mkhitaryan secured the only major trophy missing from the club’s hefty trophy cabinet. The prize was a place in this season’s Champions League – and a date with Real Madrid to contest the Super Cup in Skopje. Far more competitive than, for example, the Community Shield, the Super Cup has not always proven a fruitful competition for United. The Reds’ only previous victory came in 1991, with Sir Alex Ferguson’s side beating Red Star Belgrade 1-0 at Old Trafford. The Scot’s team lost to Lazio in 1999 and Zenit Saint Petersburg in 2008. As in 1991, United comes into this match having won the continent’s junior competition. Yet, that Europa League victory has offered the club momentum coming into the new season. Mourinho has recruited well, adding Romelu Lukaku, Victor Lindelöf and Nemanja Matic to his squad, and enjoyed a profitable summer training programme. The additions give United a more physical dimension in the season to come; a squad perhaps built for a domestic challenge rather than another European adventure. It was much the same last season, with Europa victory coming almost by accident. Mourinho only prioritised the competition once he perceived United’s chances of Champions League qualification through the league had eroded. Real will pose a sterner test than Ajax last May, not least because Zinedine Zidane’s side is now two weeks better prepared than the outfit United faced in Santa Clara last month. Mourinho’s side emerged victorious in a bizarre penalty shoot-out following a low-key draw, but the United manager admitted that Real and Spanish rivals Barcelona hold greater quality. It is the benchmark against which Mourinho’s side will eventually be judged. Real’s quality was underlined by May’s Champions League final victory over Juventus. It meant that the Spanish side the first consecutive winners since the European Cup was rebranded in the 1990s. “We are going to try, that’s obvious. But that’s also obvious the difference between the Champions League and Europa League winners,” said Mourinho. Mourinho would like to add at least one more player to a squad that is not yet fully balanced. With three weeks until the transfer window closes the Portuguese coach still holds out hope that he can add an attacking player to his ranks. His squad is probably short of a high-quality left-back too, with Luke Shaw unlikely to feature this side of Christmas. Mourinho is hardly enamoured with the former Southampton player in any case. Those weaknesses emphasise the gap United must bridge to Real and Europe’s other top sides, although the season to come must surely yield greater progress than in Mourinho’s first 12 months at United. “We talk about Real Madrid and we talk about the Champions League winners, which is the best trophy you can win in European football,” added Juan Mata. “They are the ones that everyone wants to beat. They have a great team and won the league in Spain as well. We know how good they are. But United have a great history and a great record of titles. We want, sooner rather than later, to be where Real Madrid were last season, which is in the Champions League final. We know we are on our way and building a strong team. Tuesday will be the first test of that claim. Real always takes this match seriously, with Zidane seeking to underline the Merengues‘ status as Europe’s premier side. The scale of victory over Juve places the Frenchman’s side among the very best of the modern era. The summer began with Cristiano Ronaldo seeking to leave Real after the Spanish authorities levied the former United player with a £14 million claim for unpaid tax. Ronaldo may have been posturing – as he so often has in the last five years. Zidane’s club has spent much of the transfer window selling players rather than buying them. Real sold Alvaro Morata – eventually to Chelsea not United – for around £60 million, and Danilo to Manchester City for the best part of £30 million. The goal: to bring in Monaco’s outstanding young forward Kylian Mbappé. New signing Matic may not be ready to play the full 90 minutes, with the midfielder missing most of United’s summer programme as Chelsea stalled on the transfer of the £35 million Serbian. Matic impressed for 45 minutes during a friendly win over Sampdoria in Dublin last week. Mourinho has a problem to solve defensively, with Phil Jones and Eric Bailly suspended. Bailly serves the second of a three match ban incurred after being sent off in last summer’s European League semi-final. Jones is misses two games after abusing a doping official during last May’s celebrations. Meanwhile, Tim Fosu-Mensah is set to join Crystal Palace on loan and did not travel to Skopje. Marcos Rojo and Luke Shaw remain long-term injuries, while winger-turned-defender Ashley Young is also out. The United manager could opt for a back-three – he has used system frequently in the summer – although missing players leaves the manager short of options. 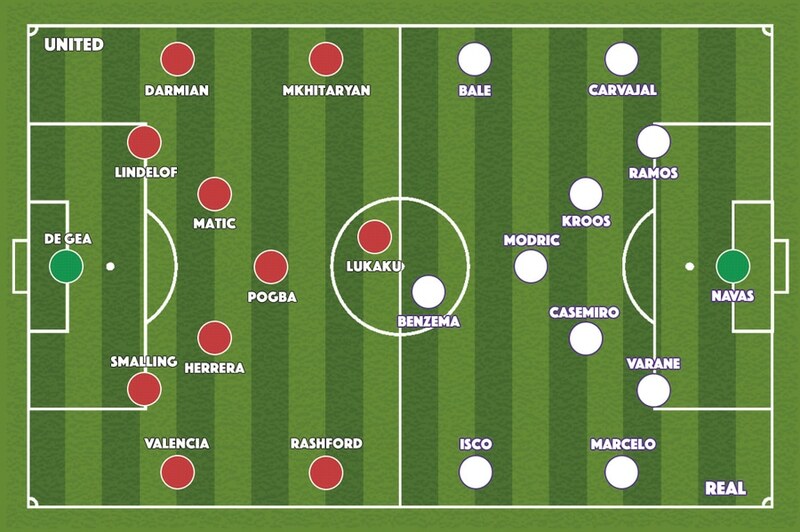 Further forward, Matic should get a half alongside Ander Herrera and Paul Pogba in a 4-3-3 system. Mourinho will choose between Marcus Rashford, Anthony Martial, Jesse Lingard, Juan Mata and Mkhitaryan to support Lukaku. Real Madrid could include Ronaldo and perpetual United target Gareth Bale after the pair both took part in Real’s training session at the Philip II Arena on Monday. Ronaldo has not featured in pre-season, but is in Zidane’s squad. Bale has recovered from yet another ankle injury. Interesting game tonight and I for 1 am really looking forward to it. Living in Madrid I’d love nothing more than walk into the office with Bragging rights on this however important you regard this trophy. Major holes on defense for us, however I’m feeling very optimistic about winning this! That was a huge difference in class – especially in the midfield where Matic was the best of UTD’s three. Herrera and Pogba just couldn’t keep hold of the ball. Of course, they weren’t helped by the poor passing out of defence. One of the commentators said it was not just a difference in “class” but also a difference between a team and a work-in-progress. That seemed to sum up matters. The Madrid players always seemed to find a team-mate and that team-mate was almost always in space which demonstrated the value of group-experience between Kroos/Modric/Casemiro and especially Isco who was everywhere and could only be contained by continual, continuous group-fouling. After Lukaku scored – after Lukaku missed ! – TheLads put more pressure on RM but I had the sense that by that time they were playing out the game rather than running up the score. Sadly, from my perspective, it was only when Jo$e had TheLads resort to long-ball tactics that RM was troubled. I suppose that one can say – one can always say – that goals-change-games and “IF” Lukaku had scored twice and “IF” Rashers had slipped the ball under the RM keeper then……. Another thing to be said, I was in the stands and it was the hottest game I’ve ever been to, the same for both teams I know, damned uncomfortable ..